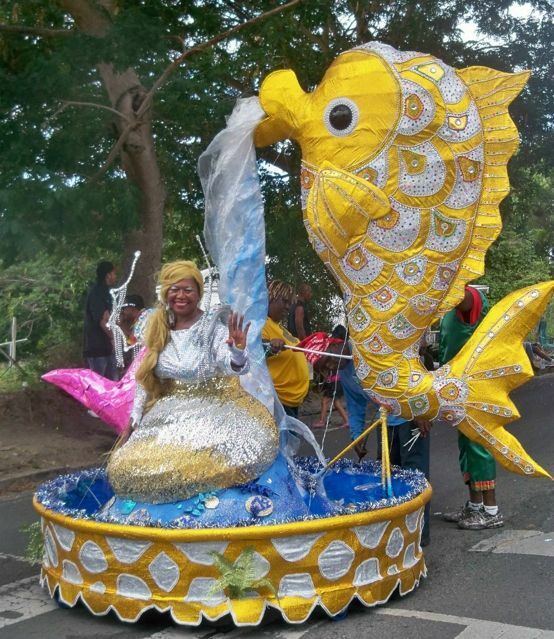 According to information received by this news site from several sources, there was no representation by Virgin Islands' bands or troupes in the St Croix Festival this time around. Every street within a mile of the pier was lined with cars and the event parking behind the ballpark was overflowing. Some people had to circle the whole town before finding a place to park, but once they were out on the street, all the frustration of getting there melted away. While the parade rolled through the middle of town, on every side street people gathered in parking lots and on sidewalks for impromptu parties with old friends. Ask anyone who lives on St. Croix and they’ll tell you the best part of the parade is the sense of community. It’s hard not to run into people you know – a LOT of people you know. Cousins, classmates, co-workers; they’re all there to greet you with a smile, a hug, and, if you’re lucky, a taste of whatever they have chilling in their cooler. "I think the community involvement brings people together in an awesomely fulfilling way, which is the best and what we really need right now," said Melissa Blaschka, who has lived on St. Croix for four years. The parade route started at the highway and snaked all the way up to the fort. The long line of floats and dance troupes moved at a snail’s pace, ensuring that the parade would last all day. When the troupes finally reached the ballpark, they broke ranks and mingled into the crowd of revelers. Many wandered out onto the beach to rest their feet. Sisters Kiara and Keiana Francis and their cousin Tiffany Straker took a moment to pose for pictures in front of the pier. Their shockingly orange feather headdresses matched the hue of the sunset particularly well. They had all been up at dawn preparing to march with the Lockhart Associates troupe. Keiana said they managed to squeeze in a quick breakfast before all of the make-up and primping. Though they’d been on their feet and dancing for hours, none of them seemed the least bit tired. That sentiment was echoed by most of the dancers at the end of the parade. Mae Williams swore she wasn’t even winded, even though she’d been weighed down by a massive costume that sprouted from her back like sails made of butterfly wings. “I had to shear against the wind,” she said with a laugh. By the beach she removed the pounds of ribbon, beads, and nylon from her back and rested for a moment against the wall. The sweat beaded heavily on her brow, but within minutes she was ready to get up and keep the party going. Raymond Galloway was not as quick to shed his wings. He seemed particularly proud of them, and with good reason. 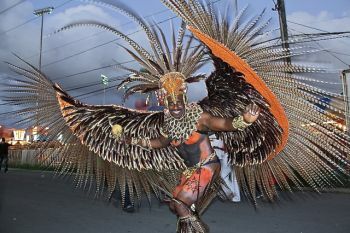 His costume had taken two weeks to finish, three days of which was spent layering dark, hawk-like feathers on arching wings that wrapped around his shoulders. He said he was a Mayan king and he looked the part. His chest was decorated with war paint and he wore a menacing headdress. 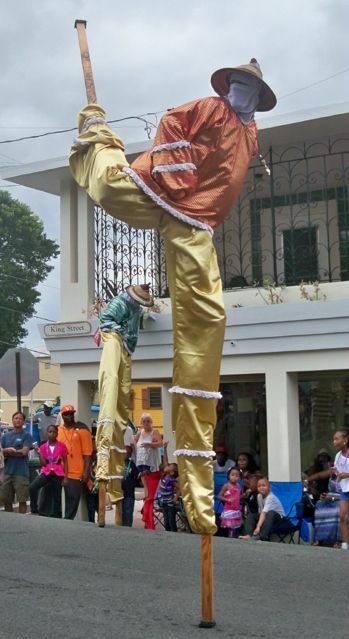 In the audience that lined the parade route, a lifelong Crucian who gave his name only as Anthony said he never misses the parade. "I love my parade and love my Carnival," Anthony said. Connie Arena has lived on St. Croix for 10 years and visited for 30. She said each year she revels in the festivities. "I love parade and I love the culture and the music. The costumes are beautiful and should be on display in a museum, they are so rich," she said. As the sun went down, the parade continued its slow progress. It would not end till well past dark. The lights of the carnival rides became ever more appealing in the twilight, and more and more revelers wandered into the festival village. Everyone knew that soon it would be dismantled, and St. Croix would return to normal. All the more reason to enjoy the night and the last few moments of the island’s magic season. Strupps!!! ayo does know wah ayo need to know about ah bit if tis waz horse race ayo would have known!! It will be nice to find out the cost of there festival so it could be compare to ours! The Lashing Dogs were over there in the Village on the 30th December.